Here I would describe my experience with p. gigantea. I’m not a great carnivorous plants grower, I’ve not a greenhouse or a terrarium, I only grow my plants for fan in poor conditions on my windowswill. This discussion is for stimulate people to grow this plant from seeds and carnivorous plants growers with more experience than me to write their considerations about this wonderful plant. I think that p. gigantea, a very popular carnivorous plant in cultivation, is not very known because there are always the same clones in culture, obtained from asexual reproduction. 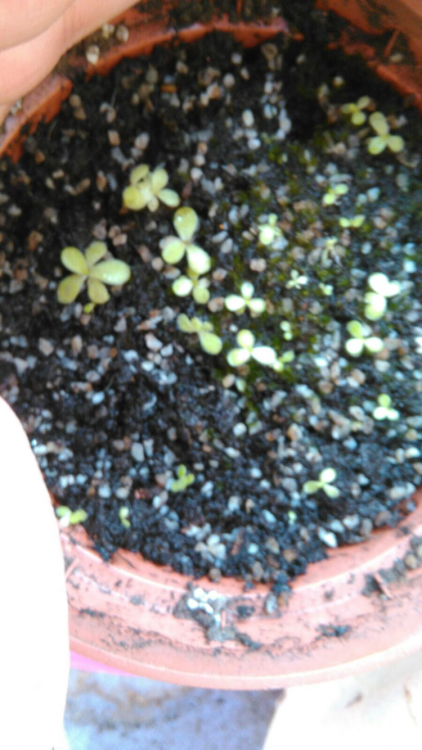 This plant is quite slow growing, so a very little growers grow it from seed. I bought my first plant from Triffid nurseries UK in March 2015. It was a great purple flower clone that You can see in photos 8 and 9. At that time I lived in the Southern part of Italy, so You can see the Etna’s volcanic dust on the pot and on the plant. I think this powder were very useful for my p. Gigantea growth. The next spring my plant flowers 3 times an I was able to self pollinate it 3 times. 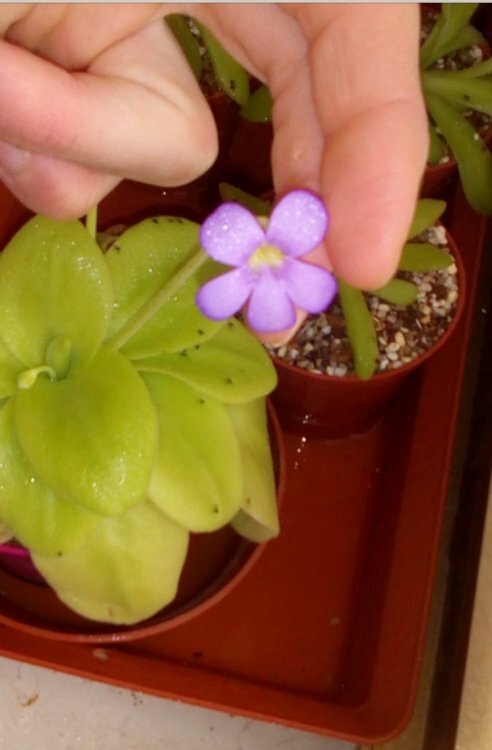 I had only this Mexican Pinguicula in flower, so there can’t be any hibrydization. The first times I‘ve sown all my seeds in peat and sand substrate and in pure river sand, but no one seed germinate. The third time, as I thought my seeds were steril, I ‘ve put them in a glass of pure distilled water, and they started to germinate in 4/5 days. 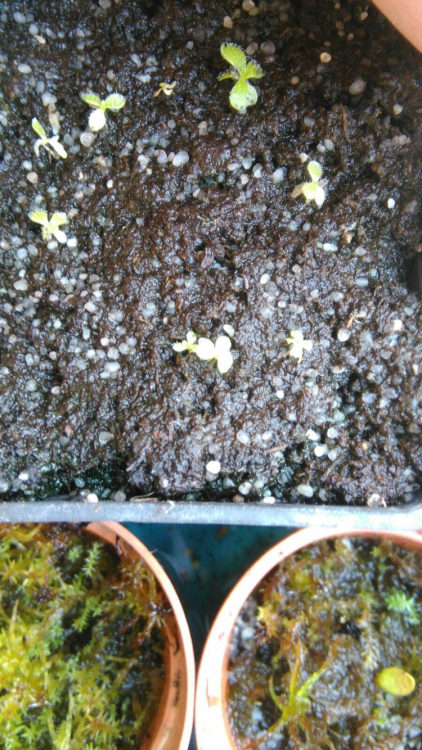 As they germinated, I put them in peat, sand or volcanic lava with a spoon. You can see them in pictures 6 and 7, and a little bigger in picture 5, 3 and 4. About the mother plant I must say that it divided himself when it flowered. The plantlets (one for every flower stalk) grew from the point where the flower stalk had boarn.. but they boarn when the flowers were old, so never from the center of the plant. About seedlings, I must say that all had carnivorous glands on both side of the leaves... some of them, when they were very little, seems to have carnivorous glands only on the upper face of leaves, but when they grew a little, they have them on both side (I write it because I’ve red that a grower had some seedlings with no gland on the lower plant of leaves). In summer 2017 I moved to north Italy and, very sadly, I’ve lost the mother plant (violet flower) and about 15 seedlings due to the trip and a storm that hit my plants. So I only saved p. Gigantea alba and two seedlings. The first one has long and narrow leaves. This winter I gave it to a friend. It was about 20 cm large. This January it made his first flower and my friend has shown me the photo. The flower was purple, very similar to his mother plant flore. When my friend will send me the photos, I’ll post them here. The second seedling is more compact, smaller, with “round” leaves in summer..the strange thing is that this plant has now divided without bloom yet (pictures 1 and 2). Now I see a very little white point that might be a forming flower. 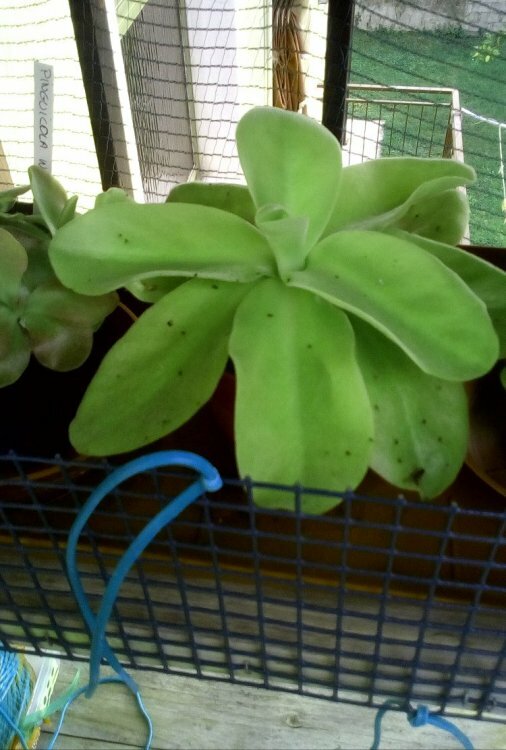 About my clone of pinguicula gigantea alba I can say that it has made 4 flowers (one will bloom in next weeks) from this January (2019). It has never divided yet. I subspect it is a sterile clone, because I never was able to pollinate it. It seems to me to have a very little pollen, so maybe I’ll try to pollinate it with my other Gigantea pollen when it will bloom. p.s. : I grow my p. Gigantea in a west facing windows when they never recive direct sunlight. temperatures: min 1 degree, max 30 degrees. I feed them with a lot of bugs and a little 20:20:20 fertilizer very diluited. 6) there is a lot of variability in seedgrown plants. Please, write here Your experiences and post here Your photos! The grew P.gigantea from seed......Thank you for interesting report! I have two clone P.gigantea, a clone that has been cultivated for long time in Japan(glands on one side, pictures 1・2) and a clone from Christian Klein(glands on both side, pictures 3・4). They had initially Yellowish green leaves. But when the feitilizer containing more nitrogen was given they, they leaves turned green. They may like feitilizer. Very very interesting!! Thanks for sharing and to post photos!!! Can I ask You a thing? Does the “Japanese clone” mantain carnivorous leaves in winter rosette too? I don’t knew this clone! beautiful plants and very well grown, thanks!! Yes,maintain carnivorous leaves in winter rosette too! It is also characterised also leaves do not grow larger like other clone. We must wait for genetic research to be sure, but it seems that we can say that p. gigantea can have carnivorous gland only on to the upper face of the leaves!! The flower of Your “Japanese clone” seems to me the flower of a pure p. gigantea... do You agree with me? 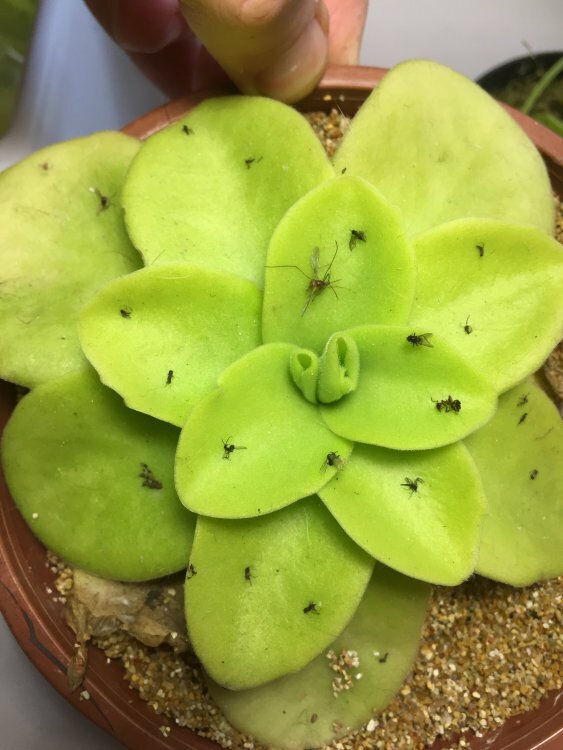 Does anybody think that the flower of the second picture of N-A post isn’t of a pure p. gigantea?